Last summer, deep in extended drought, we California beekeepers struggled with varroa. And I realized that I had long been using (and recommending) a mite treatment application based upon hearsay rather than actual data—shame on me! By trial and error, I’ve come up with a colony management program that produces strong colonies for almonds (despite my apiaries being in the dry Sierra Foothills) without needing to resort to the comb-contaminating synthetic miticides. It hasn’t been easy, but the system was pretty dialed in. Knock out mites in my spring splits with oxalic acid, hit ‘em again with a single MAQS (formic acid strip) when the supers are on in late June, then Apiguard thymol gel between the brood chambers in August and September (along with plenty of pollen sub), and then an oxalic dribble in late November. But mite counts were so high late last August that I didn’t want to stimulate broodrearing with pollen sub until we got mite levels down (otherwise, the mites would simply move into the brood). I was curious as to the most effective way to manage varroa at this time of year. So I decided to use your donations (thank you very much!) to run an experiment. Funding source: Beekeeper donations to ScientificBeekeeping.com. Two effective miticides for varroa management are thymol and formic acid. Both vaporize in the hive, the rate of vaporization being strongly temperature dependent. This creates problems during our hot (90+°F) weather during late summer. In this field trial we tested the efficacy of five different treatment methods, each repeated at 10 days, in colonies chosen for having high mite levels. 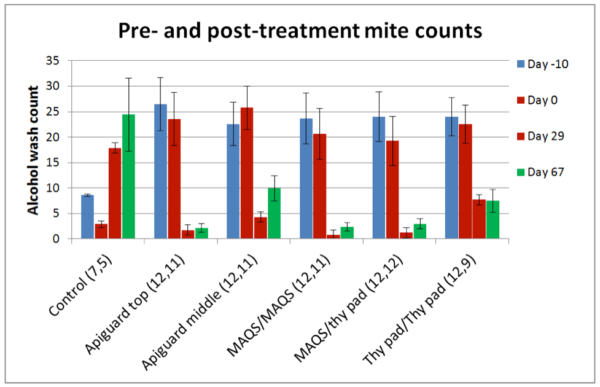 To determine which treatments strike the most efficacious balance between long-term reduction in mite level, with minimal adverse effects upon the queens and brood. Scientific note: to truly determine the effects of any mite treatment, one should monitor both mite levels and colony condition in the treated hives for at least a month or two after treatment. I was curious as to whether the Apiguard® thymol gel that I have used for years was indeed the most cost-effective application of thymol. I also wanted to experiment with other application methods of thymol that encouraged the bees to remove the substrate, in the process getting the active ingredient onto their bodies, and thus distributing it throughout the hive. I also wanted an application that left nothing to remove from the hive. So I dissolved equal amounts of thymol in various carriers/solvents, then saturated coffee filter paper with the solutions/suspensions, and placed them in hives to see which ones the bees most readily chewed away (Figs. 1 & 2). Figure 1. Color-coded pieces of coffee filter paper saturated with various solutions of thymol. Figure 2. The bees most enthusiastically removed paper saturated with thymol dissolved in glycerin, tugging passionately at the strands. The glycerin solution, being lipophilic, would be expected to adhere to their skins, thus better distributing the thymol vapors throughout the hive. Based upon this preliminary finding, I decided to use glycerin as the solvent. I then wanted to determine which concentration of thymol in glycerin would cause the bees to remove the treatment over the course of about 10 days (Figs. 3 & 4). Figure 3. Color-coded cotton facial pads soaked in various concentrations of thymol dissolved in glycerin, in order to determine the optimum concentration of thymol that would result in the slow removal of the pad over the course of roughly 10 days. Figure 4. I also tested various brands of facial pads. I found that the fiber structure of different brands varies greatly. Some form strands that the bees vigorously tug at and drag to the entrance, which I hoped would help to distribute the thymol vapors throughout the broodnest. Once I had developed a promising alternative method for the application of thymol, we were ready to choose the hives in which to test the treatments. Scientific note: there is little point in running an efficacy trial unless you start with high enough mite levels to detect a substantial difference in efficacy. That is, one gets much more meaningful data if the starting mite counts are 20 rather than only 2. So we went to our yards in which we had seen the greatest degree of mite infestation (this was early September). Our spot testing of the yards had scared the bejesus out of us due to some extremely high mite counts, so we took alcohol washes from every single hive in each yard (Fig. 5). Figure 5. We greatly sped up our mite washes by hooking up my motorized shaker table to an inverter, so that I could run it in the back of my truck. Eric and Ian took ½-cup bee samples into labeled pint jars. I could gather the jars, wash, and count the mites as fast as they shook the samples. We could easily finish a yard of 24 hives in less than 45 minutes. Practical application: at $25 per man hour, the labor for alcohol wash sampling worked out to around $2.34 per sample—less than the cost of off-the-shelf mite treatments. It was cheaper to sample each hive than to treat them all blindly. To our surprise, in the vast majority of the hives that we tested, the mites were under control (we had hit the yards with formic or thymol treatments during the previous months. The distribution of highly-infested hives was of considerable interest, and I’ll share the details in my next article. What we found was that most of the hives really didn’t cry for treatment at all. I wanted to test 5 different treatments, using 12 hives in each group, plus a control group (for a total of 72 hives). Frustratingly, we needed to take alcohol washes from over 200 hives in order to obtain enough hives with high mite counts (the highest count was 100, but we excluded that poor colony from the trial). We finally identified 76 hives with counts ranging from 8–74 mites (mean of 22—roughly 7 mites per 100 bees). We moved all those hives to a single yard for the trial. Table 1. We tested various applications of thymol and formic acid (as Miteaway Quick Strips). We ran the experiment from 9 Sept 2015 –22 Dec 2015. The experimental yard is located at the Loma Rica Ranch in Grass Valley, CA, at 2683-ft elevation in the Sierra foothills in an oak/pine forested area, with pastureland and water within flight range. We applied treatments on 17 and 28 Sept. The daily high temperatures during the treatment period were in the 80-90˚F (27-32˚C) range (Fig. 5). Figure 5b. Temperature data from a nearby (slightly higher and cooler elevation) weather station (KGOO). Dates of treatments indicated by black arrows. All hives were in full sun; the high temp shortly after the first treatment was 93°F (39°C). Chart from wunderground.com. Sep 2-8 Took mite washes in several yards to pick highly infested colonies. Sep 8 Moved all test colonies to the test yard. Sep 9 Checked all colonies for strength (removed weak colonies, leaving 70 total). Due to poor forage conditions, we fed all colonies 1 lb pollen sub patty and 1/2 gal light syrup. Sep 17 (Day 0) (following a very hot spell, and then rain yesterday): Good flight weather today. Took second mite wash, and averaged with original count. Then ranked hives by that average mite count and assigned treatments systematically to the 60 with highest counts, and 10 untreated controls. Applied treatments around 4:00 pm, temp 68F. Scientific notes: In order to test each treatment equally, we ranked the colonies by the mean of the two mite counts (preliminary and Day 0), and then assigned the 5 treatments in order to the 5 colonies with the highest counts, then again to the next 5, and down the line. This ensured that each treatment was tested over the full range of mite infestation rates. The problem was with the controls, which serve the purpose of quantifying the degree of mite increase due to reproduction and drift. If we used controls with very high mite counts, they wouldn’t survive ‘til the end of the trial (since they wouldn’t be getting treatment). So we used the colonies with the lowest mite counts (8 mites per half cup of bees) for the Control Group. The treatments are illustrated below (Figs. 6-9). 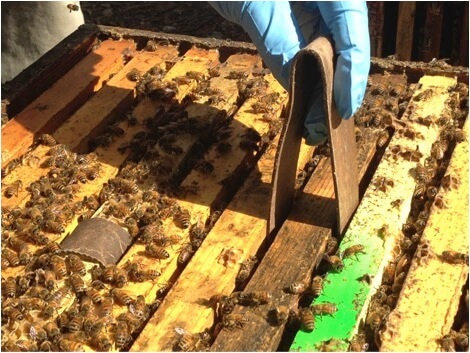 All test hives were in dark-colored double deeps. Figure 6. Treatment “Atop” (per manufacturer’s instructions). 50g of Apiguard gel on the factory card, applied to the top bars at the top of the double-deep hive, in a 1½ inch spacer rim, under a dark 3/4 inch wooden cover (that gets hot under the direct sun). Figure 7. Treatment “Amid.” 25g of Apiguard gel on an index card, applied between the brood chambers (the application method that we have used for many years). Note that we don’t spread the gel in this application, since we’ve found that it causes too severe a thymol flash off, killing excessive brood and sometimes driving the bees from the hive. Figure 8. Treatment “Tpad.” Two pads containing in total of the same amount of thymol as in Tmid, dissolved in glycerin, and placed apart over the broodnest. Figure 9. Treatment “MM.” A single (half dose) Miteaway Quick Strip, applied between the brood chambers. Update Sept 2017 A tip to make preparation of MAQS much easier–use stainless steel surgical scissors as below to zip open the wrappers. The angle of the handles, the blunted lower blade, and the razor edges make opening quick and easy, without cutting the critical membrane of the strip. 28 Sept Temp upper 80’s. All but weakest colonies have eaten all their pollen sub. Lots of propolizing of thymol pads. Censored 5 colonies that had greatly weakened. Retreated all hives, fed ~2# bulk pollen sub patty and 1/2 gal light syrup. At this point we also treated 7 additional hives on the opposite side of the yard with 2 proprietary mixed essential oil and thymol pads that I had recently been offered for informal testing (Fig. 10). Figure 10. Proprietary mixed essential oil pads. The two pads initially did not appear to adversely affect the brood in these fairly weak hives, but later appeared to be too stressful late in the season. 16 Oct (Day 29) Took post-treatment samples. Retreated the “essential oil” hives. Colonies generally weak, but a few quite strong. Lots of rust fungus beebread, but some colonies collecting yellow pollen. 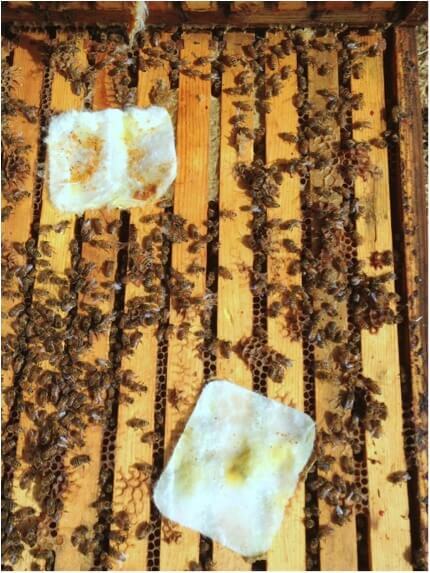 Some colonies barely covering 4 frames; others filling both boxes and whitening comb. Will continue feeding. Did not check all colonies for queenrightness, but did check those that appeared especially weak. 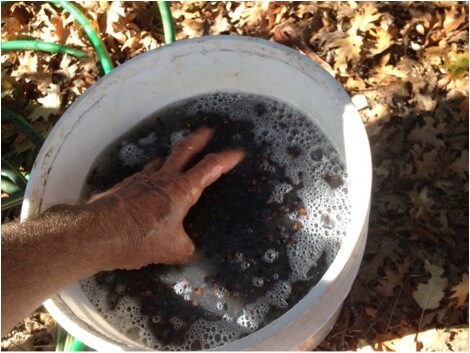 20 Oct Censored and treated 2 Control hives and 1 Tpad hive from the yard due to excessively high mite counts. 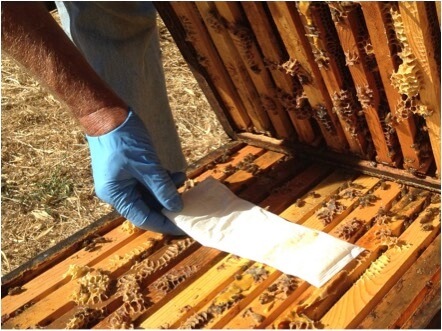 22 Oct Inspected all Atop hives for queenrightness and condition of brood. All were QR and brood looked good. Fed all hives pollen sub and scored for strength. 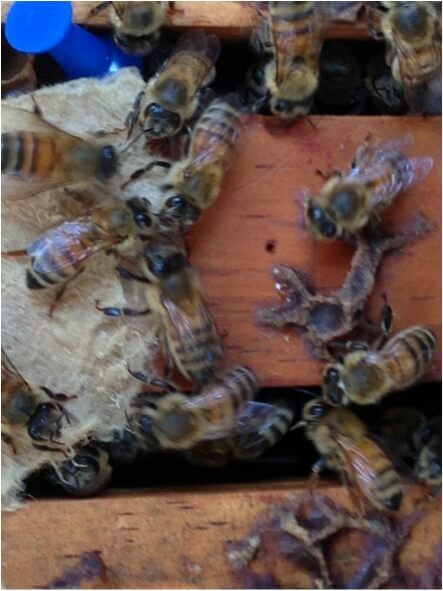 2 Nov Fed all colonies pollen sub and again recorded queenlessness, and the strongest and weakest colonies. 23 Nov (Day 67) Took final mite counts, and validated our sampling method (Fig. 11). Figure 11. In order to confirm the efficiency from our alcohol washes, I dumped the washed bees (approx. 21,000 bees) from the final washes into a bucket, then hand rewashed them in soapy water, and then placed them a handful at a time in a sieve, and washed them thoroughly with a garden hose to recover any missed mites. I didn’t recover a single mite—validating the efficiency of our mite washing technique. From this point on, we performed informal experimentation and follow up. 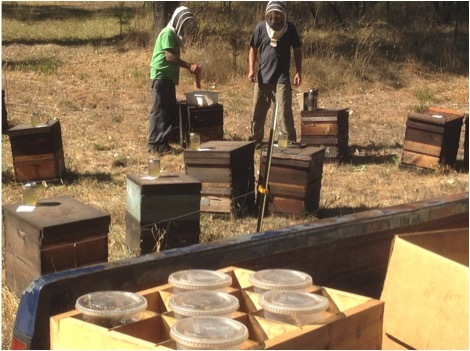 I had been contacted earlier in the season by Argentine beekeeper Fernando Esteban, who brought to my attention a novel method of application of oxalic acid being used by beekeepers in Argentina (the method was subsequently described in a scientific paper ). Following his directions , I made up some oxalic/glycerin strips. 1 Dec Treated 4 high-mite colonies with oxalic/glycerin strips. 10 Dec Graded all colonies for strength. Only the Controls and thymol pads stood out as being of lower average strength. 22 Dec Took mite washes of oxalic/glycerin strip colonies. In three of the colonies, the clusters had moved away from some of the strips. Although we ran no controls for this small informal test (and could thus not calculate efficacy), our results (Table 2) reflected the results of Maggi, who recorded efficacies of over 90% after 6 weeks of treatment. The strips are relatively simple to make and install (Fig. 12). However, even after several months, the bees had not chewed them out. This may have the advantage of extending the treatment (since they still had oxalic acid crystals on the surface), but raises a huge caution to beekeepers not destroy oxalic acid’s utility as a mite treatment by leaving them in the hive. Figure 12. 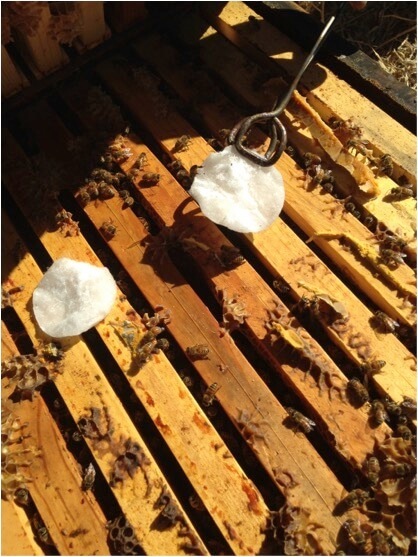 One of the newest weapons in our arsenal against varroa are oxalic/glycerin strips, which provide release of oxalic acid over an extended period of time. Table 2. 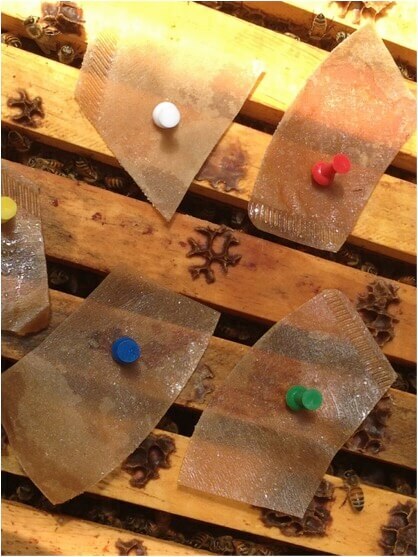 Results of testing oxalic/glycerin strips on 4 hives. Note that at this time of season, we would have expected mite counts to drop to some degree even without treatment. However, these results, as well of those of Maggi, are certainly encouraging! Practical application and a cautionary warning: the oxalic/glycerin strips show great promise, and I will continue testing. The downside, however, is that some beekeepers will of course keep them in their hives continuously (especially since the bees do not remove the strips), which will apply a strong selective pressure on varroa to develop resistance mechanisms to acids. Beekeepers have a history of shooting themselves in the foot by overusing treatments without rotation, resulting in resistant mites and bacteria. If you use these strips, please do not leave them in your hives continuously, as you may then inadvertently be breeding mites resistant to acids, which could ruin it for the rest of us. I did not include any mixed essential oil treatments in the formal trial, since in my previous experience, they have either caused excessive disruption to the colonies (e.g., the essential oils in ApiLife Var® cause loud fanning during the course of treatment), or were simply ineffective (I’ve tried any number of mixtures of essential oils in vegetable oil or shortening, on shop towels, in patties, or in pads). However, a couple of beekeepers for whom I have great respect each sell proprietary mixed essential oil pads or patties, and one of them gave me a box of pads to test, unfortunately after I had already begun the formal trial. According to the maker, these pads contained about 6.25g of thymol each, along with a proprietary blend of other essential oils, in vegetable oil. The brood in the treated hives looked good on 28 Oct, after 30 days of continuous treatment with 2 pads on relatively small colonies, and mite levels had decreased (Table 3). But by a week later, 2 of the 7 hives had crashed, I suspect from all the essential oil vapors simply being too stressful on small colonies late in the season (note that colonies in this location were still actively rearing brood in October). Perhaps these pads would be best applied to stronger hives in warmer weather. Table 3. Again, no controls, so I couldn’t determine efficacy. But the pads appeared to reduce mite levels in nearly all of the test hives. A number of beekeepers keep essential oil pads in their hives over much of the season. I’ve yet to see data confirming that such continuous exposure to irritating vapors is of actual benefit to the colony. In the controlled trial I was able to calculate treatment efficacy. Please refer to Fig. 13. The blue and red columns to the left of each group reflect the preliminary and Day 0 mite counts, respectively. The next red and green columns show the Day 29 and Day 67 mite counts. Figure 13. Mite levels climbed in the Control hives. 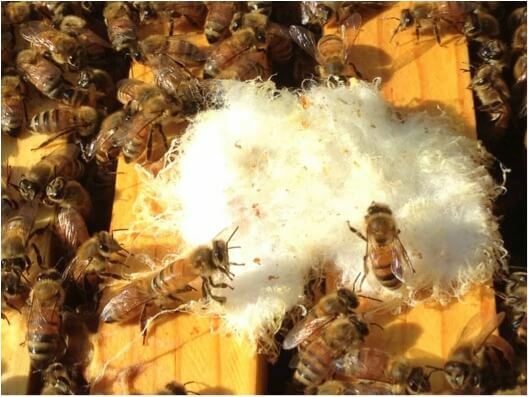 The three most efficacious treatments were Apiguard applied twice to the top of the hive, a single MAQS strip applied twice in the broodnest, and a single MAQS followed by a thymol pad. For each group, the starting and final numbers of queenright colonies are shown in parentheses (2 Controls were removed after Day 29 due to excessive mite counts). In the single MAQS/MAQS treatment, 3 colonies lost their queens; 2 then successfully requeened themselves, but one went queenless. In the MAQS/Tpad one queen was lost, and the colony was unsuccessful at requeening itself. One queen was lost in both the Control and thymol pad treatment groups. Despite being treated at only half dose of MAQS, there was still a degree of queen loss from the formic acid treatments. This is a nagging problem with formic acid that needs to be solved. Despite the observation that those queens that are lost are likely those that are already on their way downhill, the issue remains. Practical application: one simply solution is to coordinate formic treatment with annual requeening. My sons and I are currently experimenting with this in our operation. There are likely improved methods for application of formic that minimize queen loss—please let me know if you’ve figured one out! Although not yet perfect, MAQS are a valuable tool in our arsenal of varroa treatments—especially since they can be applied while honey supers are on, and they kill the mites in the brood. I calculated the efficacies of the five formally-tested treatments, using the Henderson-Tilton formula. 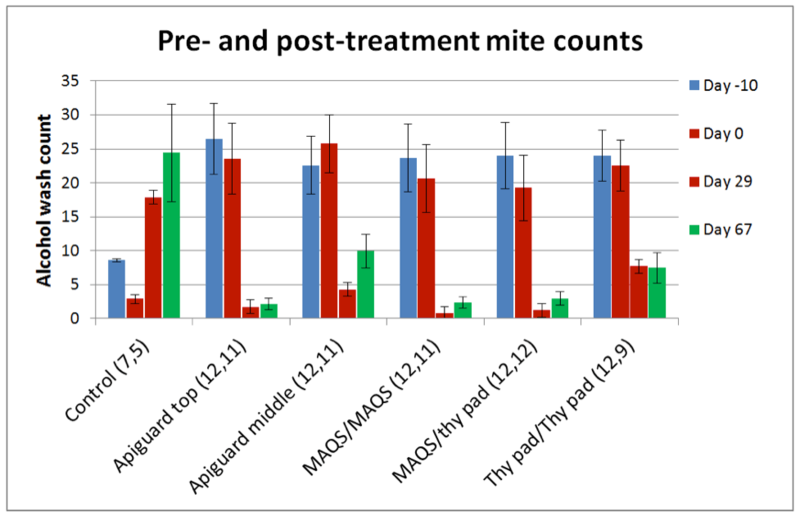 Due to the explosion in mite counts in some of the Control group hives, the efficacies may have been skewed high, but calculated at 99% for the three most efficacious treatments, and 95% or above for the rest. Practical application: it’s sooo easy to fool yourself! The results of this trial are a good case in point of a common pitfall in beekeeping, of which, in retrospect, I was completely guilty—the crime of fooling oneself. When Apiguard first came on the market years ago, I heard from some commercial California beekeepers that it was too stressful on the bees to apply it according to label directions (50 g under the lid) during our hot, dry California summers. Better, they said, to apply a half dose between the brood chambers. I tried that, and it indeed still worked to reduce mite levels effectively (and at half the cost). And it made perfect sense—Why place a temperature-dependent vaporizing product under the hive cover (where temperature can range wildly over the course of the day), when you could place it in the center of the broodnest (where the bees maintain a constant temperature)? And the more years that I applied Apiguard in this manner, the more cemented in my mind the wisdom of the method became. But the error in my logic was that I had never actually tested the two methods against each other, nor searched for valid data from others. However, as beekeepers are want to do, I started wondering if there was a better way to apply thymol, what with all the various concoctions either on the market or brewed up in beekeepers’ kitchens. And what got me to reconsider top application was when I dug into the literature on thymol application and came across a great study by two wonderful Italian researchers– Marco Lodesani and Cecilia Costa , who actually did compare the efficacy of Apiguard using different heights of spacer rims. 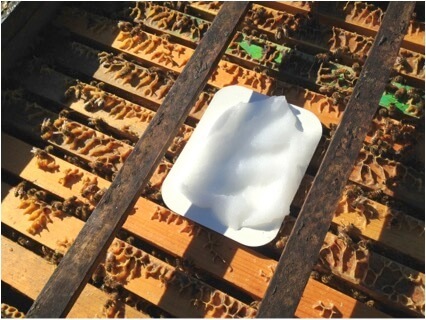 They found that increasing the space between the top of the frames to the bottom of the hive cover from roughly ¼ inch, to 1 inch, to 2½ inches increased the efficacy of a double Apiguard application from 78%, to 88%, to 92%, respectively. I was disappointed by the performance of any of the forms of thymol applied in the broodnest, as they not only exhibited somewhat poorer performance than the alternatives, but appeared to have a more negative effect on the queens and brood. On the other hand, I was quite impressed by the performance of Apiguard gel, delivered to the top of the hive, with a 1½-inch spacer rim. What I found (to my surprise) in this trial (and during preliminary testing on a couple of hives in 90+˚F (32+˚C) weather) was that with a 1½ rim, that there were no noticeable adverse effects upon the bees, brood, or queen from the full 50 g dose. Lesson learned—I had been misled years ago, and had uncritically been using an inefficient method of application based upon unfounded fears. This is not to say that there is no merit to the possibility that there may be times when Apiguard might best be applied in the broodnest. The Apiguard label states that it must be applied (under the cover) at temperatures above 60˚F (15˚C). I’ve gotten good mite reduction in cooler weather by applying 25 g between the brood chambers. A shortcoming of most miticides: In my preliminary testing of thymol on cotton pads (data not shown), I was surprised to find that even when I really blasted colonies with thymol (to the extent of killing brood and causing the bees to shift the location of the broodnest), that the mites in the brood did not die. Thus the need for an extended period of treatment, so that as mites emerge from the brood they are exposed to the product. 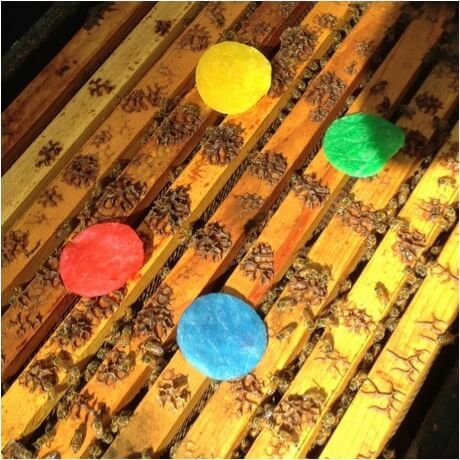 A single Apiguard application (which lasts for about 10 days) would not span the period of time during which a mite is under the capping (12 days), and would thus be unable to hit all the mites in the hive. The label states that one should apply the second treatment after two weeks, but in this trial all but one of the colonies had completely removed the gel by 10 days, so I repeated the application at that time to ensure continuous exposure to the thymol vapors. The label further states that total treatment should be for a minimum of 4 weeks (maximum 6). During this trial, the two 50-g doses lasted for roughly 3 weeks in total, yet gave perfectly satisfactory mite control. 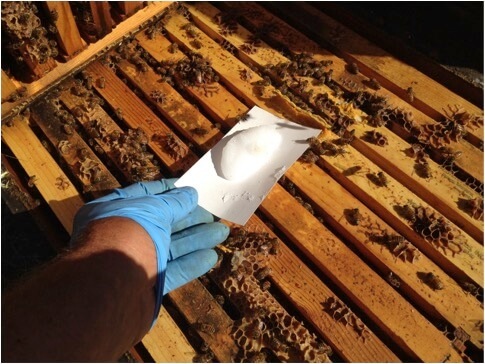 The label also states that small and wintering bee colonies and nuclei require one 25g dose only, left in place until the product disappears from the tray. There are now three highly-effective “natural” varroa treatments on the market—Apiguard, MAQS, and oxalic acid (Hopguard® may also be effective under some circumstances), as well as the synthetic miticide Apivar® (amitraz). Beekeepers in every country have demonstrated how easy it is to breed for varroa resistant to miticides, simply by using effective products without rotation or other biotechnical methods. Folks, let’s start getting smarter—breed for (or demand from your suppliers) mite-resistant stock, practice biotechnical methods such as splitting, induced brood breaks, drone brood removal, and rotate treatments. Never apply the same treatment several times in a row, as you will simply be selecting for more and more resistant mites. Dissolve 600g of oxalic acid dehydrate into 1000g of food-grade glycerin (glycerol) heated to 65˚C (150˚F). Stir until the oxalic acid is completely dissolved, and the solution is clear. Then soak soft cardboard strips in the solution overnight, allow to drain, and apply 2-4 strips per hive, draped over the topbars in the broodnest. Lodesani, M & C Costa (2008) Maximizing the efﬁcacy of a thymol based product against the mite Varroa destructor by increasing the air space in the hive. Journal of Apicultural Research and Bee World 47(2): 113–117.